Arsene Wenger says managers must be "careful" when criticising their own players and "control what you say". Wenger's Arsenal side face Jose Mourinho's Manchester United on Sunday (kick-off 16:00 BST), battling to reach the Premier League's top four places. Mourinho has questioned the desire of defenders Luke Shaw, Chris Smalling and Phil Jones to return from injury. "You can do that in extreme situations but it has to be handled carefully," said veteran Arsenal boss Wenger. Mourinho questioned full-back Shaw's commitment and focus to the club last month and then said the player used "his body with my brain" after the 1-1 draw against Everton two days later. The former Chelsea manager was also unhappy with the "cautious" mentality of centre-backs Smalling and Jones for failing to play through pain during the Manchester derby. 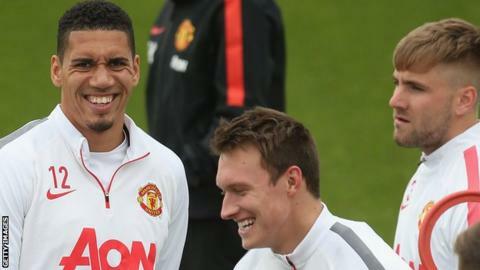 Smalling has been struggling with a leg injury, while Jones suffered a toe problem in a training ground tackle made by his team-mate. Luke Shaw, problem or punchbag? This week, former Blackburn striker Chris Sutton said Mourinho was "humiliating" his players by querying their dedication to the Red Devils. Wenger added: "Ideally you have to be careful with that because you cannot do that in every single game. "You can do that in extreme situations but it has to be handled carefully because it just makes that stress level worse for them. Top players have a good and objective assessment. They know well where they stand. "You cannot always say to the players 'we are all in the same boat and in this together to achieve something' and then you jump out of the boat and say, 'it's your fault now', but when it goes well you take the credit. "You are in a position where you have to be part of it and fight for them when it doesn't go well, you have to control what you say." United go into the game five points ahead of sixth-placed Arsenal, having played a game more, but are four points adrift of fourth-placed Liverpool, although the Old Trafford club have a game in hand. Manchester United winger Ashley Young has been ruled out of the game at Arsenal with a hamstring injury. Young, 31, was injured after coming on as a substitute in the Europa League semi-final win over Celta Vigo on Thursday. It is not known exactly how long Young will be out for but there are fears he could be sidelined for the rest of the season. United manager Mourinho has threatened to play youngsters at the Emirates Stadium after deciding to prioritise his side's European campaign. Four players yet to make a first-team appearance have been included in his travelling squad for tomorrow's game. Matty Willock and Scott McTominay have been included in recent United squads. They have travelled to London, along with 20-year-old England Schoolboys winger Demetri Mitchell and teenage United States Under-19 international defender Matt Olosunde. Arsenal could be without midfielder Granit Xhaka who has a calf problem, but defender Shkodran Mustafi could play after returning from a back injury.